Cupertino, California, April 1st. The exciting world of 64-bit desktop dual-core computing has arrived! 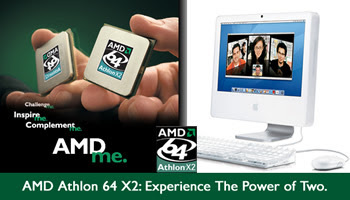 Introducing the new AMD Athlon™ 64 X2 with HyperTransport™ technology, the world's third Mac OS X compatible 64-bit processor that's designed for those who want to stay at the forefront of technology and depend on their Macs to keep them connected, informed and entertained! The revolutionary architecture of the AMD Athlon™ 64 X2 with HyperTransport™ technology enables industry-leading performance to maximize productivity and deliver a true-to-life digital entertainment experience. It's designed to deliver outstanding levels of performance and customer-focused innovation.